Bryson City is often referred to as the "Outdoor Adventure Capitol of the Smoky Mountains" and rightfully so. It is home of the Nantahala River Gorge, where world-renowned rafting and kayaking can be found, as well as zip-line canopy tours. Also the perfect spot for mountain biking, hiking, and more. The Nantahala River offers world famous whitewater rafting and kayaking for anyone ages 7 (60lbs) and up! 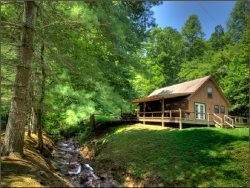 Located just 20 minutes west of Bryson City, you can easily plan a day of adventure and then come back to relax in your cabin. There are many outfitters that offer guided or self-guided tours on a variety of raft styles. As guests of our cabins, specific companies will offer discounts on rafting and package tours. Information will be provided in your cabin book upon check-in. Want to take in the Smoky Mountains by the thrill of "flying" through it? The Nantahala Gorge has several different companies that offer Zip Line Canopy Tours. Nantahala Gorge Canopy Tours and the Nantahala Outdoor Center offer these amazing tours. As guests of our cabins, you can take advantage of exclusive discounts. Information can be found in your cabins on check-in. The Tsali mountain biking trail area, 15 miles west of Bryson City, is a 42-mile network of multi-use trails consistently rated one of the top ten riding destinations in the United States. For shorter, easier biking try the wider trails at Deep Creek (map) and the 3-mile (in and out) Oconaluftee River Trail in Cherokee. Bryson City has tons of hiking trails, both locally and throughout the Great Smoky Mountain National Park. There are trails for everyone - light family friendly hikes, pet-friendly hikes, and more advanced hikes. The following link has great detail of the trails in our area. Deep Creek offers a wide array of outdoor activities for every member of the family. Choose from whitewater tubing, swimming at the swimming hole, & hiking to waterfalls are available to those wanting a little adventure. Nantahala Village Resort Riding Stables offers guided horseback trips in the Nantahala National Forest overlooking Fontana Lake & the Great Smoky Mountains National Park.